Thanks to all above for this thread from last year. It's just saved me a lot of head-scratching. If I was a seven-days-a-week race officer I'd no doubt fully master Sailwave, but it just has too many hidden tricks and pitfalls like this for occasional ROs, or even for semi-regular ROs like myself to discover then remember. Hope that doesn't sound ungrateful, because I'm not. Sailwave is great program for sailing clubs that covers a host of possibilities, but I'd suggest that future development needs to be focussed improving accessibility for twice-a-year ROs. Hopefully I can clarify it a little. 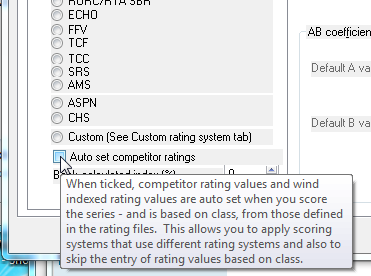 Ratings come from the ratings file when you first enter them and Sailwave remembers the ratings for any class that you override. So in normal use it is very easy it gives you the default but allows you to override it to a value that is specific to your club. If you want to load all the values from a file every time (or a new set then you tick the box) but this is not the normal. You don't say what version of Sailwave you are running but the later ones do have a User interface in the Setup to make it easier for the twice a year RO's as this enables it to be configured with features removed that are not applicable to the specific user. Unfortunately Scoring is not always a simple job due to the different rules and parameters that different clubs use. Please if you have any suggestions as to how it can be made easier then please let us know. We're currently using 2.9.7.0, frozen simply so that the various users in the club can exchange files without the risk of problems such as we had in the past when we upgraded independently. We should probably update the version regularly, say once a year, and now would be a good time to do it. I must agree. The more it behaves like a spreadsheet the better for the casual user.